According to the evidence presented at trial, between 2004 and 2015, Steven Lynch, a tax attorney, co-owned and operated the Iceoplex at Southpointe, a recreational sports facility located in Washington County, Pennsylvania. The Iceoplex included a fitness center, ice rink, soccer court, restaurant and bar. Lynch controlled the finances for these businesses and was responsible for collecting income and employment taxes withheld from employee wages, accounting for these taxes and filing Forms 941, payroll tax returns, and paying these taxes over to the Internal Revenue Service (IRS). The jury found that between 2012 through 2015, Lynch failed to timely pay over to the IRS more than $790,000 in taxes withheld from the wages of the employees for these businesses. 1. For some years, the IRS and DOJ Tax have been stepping up their criminal enforcement efforts in the employment tax area. The point the IRS and DOJ Tax wants to make that those who think that this is just a civil tax issue may be mistaken, and may be criminally investigated, charged, convicted, sentenced and spend some time in jail, all the while remaining liable for the taxes evaded (and a host of related costs, including other penalties and fines). 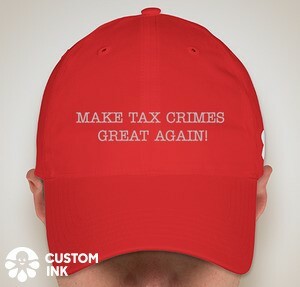 And, even if they are lucky enough to avoid all those criminal related costs, they are still subject to potential trust fund recovery penalty liability under § 6672, here, titled "Failure to collect and pay over tax, or attempt to evade or defeat tax." (Readers should note that, although the titles of the criminal and civil provisions are slightly different, the substantive language is virtually the same, with the criminal statute simply requiring proof for conviction beyond a reasonable doubt. Not a comforting thought for those who play this game, as the IRS and DOJ Tax increase their criminal enforcement efforts. 2. Based solely on the sentencing factors noted in the press release (indicated tax loss over $790,000, no acceptance of responsibility downward adjustment, and presuming the pre-2015 Guidelines), the indicated Guidelines level is 20 (according to my Guidelines spreadsheet) and the indicated sentencing range is 33-41 months. (By contrast, had Lynch pled guilty to achieve an acceptance of responsibility downward adjustment (or, in the rare even he might otherwise qualify for acceptance of responsibility) the sentencing level would have been 17 with an indicated range of 24-30 months, so that he could have achieved a 9 month lesser sentence at the bottom of each Guidelines range.) Of course, the judge can always do a Booker variance, which, in tax cases, is almost always downward. But that will depend upon factors not evident from the press release. Those additional factors are produced for the court in the Pre-Sentence Report ("PSR") and the parties sentencing submissions after review the PSR. When the sentence is announced, I will dig around what is the in public report (usually not the PSR, but perhaps some contested portions of it) and report back. 3. Robert Horwitz, a seasoned criminal tax attorney, here, called my attention to a typo on the blog and to a more substantive issue. I have corrected the typo. More important is the substantive question he raised. Paraphrased, he asked whether, as specifically stated in the press release, the jury found that Lynch failed to timely pay over $790,000. Readers will recall that, in tax evasion cases, the jury finds only that the defendant committed tax evasion, but does not find a specific amount. (This was the issue addressed in the blog entries on the Senyszen case discussed in 3 blogs, here.) The conviction here was for willful failure to collect and pay over, § 7202, here. The amount involved is not an element of this crime, so Robert's question was whether the DOJ press release was correct that the jury made a finding on amount of over $790,000. Tax obstruction, § 7212(a) (one count, presented as Count 1): Jury verdict: NOT GUILTY. 2. Failure to collect and pay over, § 7202 (28 counts, one per employer per quarter, presented as Counts ___ - ___, with one in that series dismissed): NOT GUILTY ON 11 COUNTS, GUILTY ON 16 COUNTS. My calculations from the superseding indictment shows the following: tax amount for 16 counts of conviction $725,728; tax amount for 11 not guilty counts $694,044, tax amount dismissed count (count 12) $24,998, aggregate tax amount $1,444,260. I am not sure where the reported $790,000 amount comes from, but I do note that the amounts could have been refined in the presentations at trial. In any event, the key break point for the sentencing calculations is $1,000,000. As readers know, the intended tax loss ("tax loss") is determined at the sentencing phase for the first, most critical, step in the sentencing guidelines calculation. Importantly, in terms of the guidelines calculations, though, the tax loss for the guidelines calculations also includes the tax loss for "relevant conduct." See §1B1.3. Relevant Conduct (Factors that Determine the Guideline Range), here. The tax loss involved in not guilty counts may well be in play in calculating the guidelines range because the standard of proof is preponderance of the evidence rather than beyond a reasonable doubt. Using the indicated tax loss for the counts of not guilty verdicts, the aggregate loss will move the calculation to the next bracket (which covers the range from $1,000,000 to $2,500,000, so that is a comfortable conclusion for the not guilty counts). That will move the sentencing table calculation to offense level 22 and an indicated sentencing range of 41-51 months. Finally, with 16 counts of conviction for the 5 year § 7202 felony, the maximum sentence could be 80 years. As indicated, even with relevant conduct, the guidelines calculations will produce a sentence of far less than that. 4. Based solely on the pattern of the guilty verdicts compared to nonguilty verdicts, there is at least the possibility of a compromise verdict. Thus, hypothetically, some jurors may have wanted to convict on all counts and some may not have wanted to convict on any counts or some small number of counts. In order to achieve unanimity on all counts, the jury may have just done some version of split the baby. Jury compromises create some conceptual problems. For those wanting to pursue the issue, I recommend the following article as a good introduction and perhaps a place to start for other research: Allison Orr Larsen, Bargaining Inside the Black Box, 99 Georgetown L.J. 1567 (2011), here. There is a lot of good stuff in the article (also do not ignore the footnotes), but here is the introduction to whet your appetites. When jurors are presented with a menu of criminal verdict options and they cannot reach a consensus among them, what should they do? Available evidence suggests they are prone to compromise—that is, jurors will negotiate with each other and settle on a verdict in the middle, often on a lesser-included offense. The suggestion that jurors compromise is not new; it is supported by empirical evidence, well-accepted by courts and commentators, and unsurprising given the pressure jurors feel to reach agreement and the different individual views they likely hold. There are, however, some who say intrajury negotiation represents a failure of the jury process. Conventional wisdom clings to the notion that criminal verdicts reflect a jury’s unanimous factual assessment. That notion is thwarted when a juror votes for a verdict as a compromise, as a second choice to the one he thinks best reflects reality. To date, therefore, compromise verdicts are typically dismissed as examples of maverick jurors dishonoring their oath to apply the law and seek the truth. This Article challenges that conventional wisdom by way of a new analogy. If jurors each view the case differently and nonetheless negotiate with each other to reach a deal, why is that wrong when 95% of criminal convictions are the result of a similar process? I seek a new understanding of compromise verdicts by making a novel comparison to plea bargaining. I argue that the former should be understood in the context of the latter and that the best way to evaluate intrajury negotiation is to juxtapose it with the negotiation that dominates our criminal justice system. Instead of dismissing intrajury negotiation as illegitimate, I argue that we should accept it as a reality and from there seek to improve it with lessons drawn from plea negotiations. I think particularly interesting in the article is the analogy to plea bargains at an earlier stage of the criminal justice process and the compromise nature of lesser-included offense doctrine (conviction of fewer than all accounts, as occurred in Lynch, may be a variation of what occurs when a jury convicts of a lesser-included offense, without the formality of the lesser included offense instruction). -> Are the levying of bank accounts considered to be a part of "the proper administration" of the IRS laws? Also referred to as the "due administration"
-> Is She seizing of Cash from bank Accounts under the umbrella of "proper/due administration" Is proper/due administration more limited to the timely recording of tax liability and timely communication with debtors? Basically seeking a more clear definition of proper/due administration. What is balance adjusted trust fund recovery penalty cases - Please define !! We collectively thank you for your inquiries set forth on Court Exhibit No. 3. The parties chose to place into the record the testimony and exhibits they wish for you to consider. You will have to decide the questions on the Verdict Slip to the best of your ability, based upon the record as it stands, following the law as instructed by the Court in its Final Jury Instructions. As I said, I do not have the final jury instructions which the jury question #1 and the judge references. Also, the judge would likely have discussed the jurors' questions with counsel for the parties before responding to the jury; I don't have that discussion. I therefore can only comment as to the questions and the answer given. In my view, the judge's answer is basically a nonanswer. Such nonanswers are often given where the instructions might otherwise be adequate and providing a responsive answer (rather than a nonanswer) might require more complexity and risk more confusion than a nonanswer. IRS levies on bank accounts is a step taken in the proper and due administration of the IRS. Seizing of cash from bank accounts to satisfy tax liabilities is a step taken in the proper and due administration of the IRS. The proper and due administration of the IRS Is not limited to the recording of the tax liability and timely communication with debtors. Without the answers to these questions (i.e., with the judge's nonresponse), the jury found Lynch not guilty as to the tax obstruction count. The problem is that a straight-forward answer to the jury's questions might be viewed as virtually a direction of a verdict of guilty (depending upon the facts adduced at trial). That is probably why the judge did not answer the subparts of question 1. And, although I don't have the instructions on that count, I would be surprised if the words used would not provide the answer. Nonetheless, the jury asked the question because the jury or some members of the jury did not think the instructions answered the question. So, the jury could have inferred that the judge's nonresponse to the question's subparts meant that such action is not within the scope of the tax obstruction count. Order on Trial Time Limits. The judge issued an order titled Memorandum Opinion re: Defendant's Objection to Time Limits, here. Prior to trial, the judge conferred with the parties regarding their expectations of the length of trial. After that, the judge "set reasonable time limits of 15 hours per side for direct and cross examination of witnesses," but reserved the right to reconsider based on developments at trial. Defendant complained before trial, but the judge refused to reconsider, reminding that the matter may be reconsidered during trial. Then, before the second day of trial, defendant again raised a "continuing objection" to the limits set. In this order, the judge states why he denied that continuing objection. The judge's reasoning is worth reading. Among the issues considered was that the defendant apparently declined to work with the prosecutors for stipulations to avoid unnecessary duplication and save time. "Further, now after one and one-half days of trial testimony, a substantial amount of the trial testimony was not in dispute, and could have easily been made part of stipulations of fact." Order on IRS Testimony and Summary Exhibits. The judge issued an order, titled Memorandum Order re: Defendant's Motion to Preclude Lay Opinion Testimony and Exhibits of IRS Revenue Agent Lisa Gapsky (Doc. No. 196), here. This was in response to the defendant's third objections, the prior two having been denied. The order is short and worth a read.